Operating Systems Head to Head – Ubuntu 12.10 or Windows 8? The world of Operating Systems has recently witnessed major upgrades from two of the most popular figures in the arena. Microsoft has released its first touch OS, Windows 8. The OS that gave way to a whole new range of devices most popularly referred to as the convertibles. On the other side, Canonical also announced the release of the latest version of Ubuntu, Quantal Quetzal, which introduced some new features (and got rid of some old ones). Both of them have been received critically among the users and testers. This article takes a dive into the various features of the two operating systems and tries to compare between their latest versions. Before starting off, we want to compare the system requirements for running Windows and Ubuntu, concentrating particularly on the latest versions. The hardware specs for Windows 8 is a bit higher than its predecessor. To run Windows 8 smoothly, you need a minimum processor speed of 1 GHz. For the 32 bit version, a minimum of 1 GB RAM is required, while for the 64 Bit version, minimum 2 GB of RAM is required. Graphics is the most important factor in order to use some of the unique features of Windows 8. According to the official specifications, you need a computer having support for DirectX 9 with a driver conforming to the WDDM 1.0 specifications or higher. Additionally, the device also needs to support a minimum screen resolution of 1024 x 768 to use the Windows Store apps, and 1366 x 768 to use advanced features like Snap. Unfortunately, Windows Store Apps cannot run on netbooks and other low end devices because netbooks generally have a maximum screen resolution of 1024 x 600 (less than the minimum required amount). Also, if your computer runs on shared accelerated graphics, you may experience problems while launching these apps. If you own a low end netbook, you’re out of luck because Windows 8 is not for you. Ubuntu has lower minimum hardware requirements as compared to Windows. As of version 12.10, Ubuntu’s minimum system requirements include 1 GHz processor, 512 MB RAM and a supported Graphics Card. One issue with Linux based systems has always been the lack of compatible drivers. Although Ubuntu automatically detects devices and installs a suitable driver, some graphics drivers – like some cards belonging to Intel’s GMA series – are not available for Linux (and hence Ubuntu). Prior to version 12.10, Canonical maintained a fallback desktop interface without the 3D effects for systems with incompatible graphics (Unity 2D). But in the latest version, they dropped support for Unity 2D. Devices with incompatible graphics can now run Unity 3D desktop interface using software acceleration, although there might be a performance downside too. Like Windows 7, the size of the Windows 8 setup is a little over 2.4 GB for the 32 bit version and about 3.3 GB for the 64 bit version. You can install Windows 8 on your computer in two ways – Clean install or a Streamlined Upgrade. Clean installation takes about 30 – 45 minutes on a system that meets the hardware specifications. But the most exciting feature is the streamlined upgrade option, which directly upgrades your Windows 7 computer to a Windows 8 one without losing your files and settings. It even retains your previously installed applications. The upgrade option is an executable program launched within Windows 7. It downloads the required files and gets your system ready in 11 clicks. Depending on the volume of files and pre-installed applications, installation time varies between 45 minutes to about an hour. Unfortunately, Windows does not provide any live version. If you want to try Windows (8 or any other version), you must install it first. Total installation size on disk for Windows 8 is about 16 GB for the 32 bit version and about 20 GB for the 64 bit version. After installation, you will be prompted to choose a color for your Start Screen, log in with your Microsoft account and sync all your settings and you are nearly done. After a restart (the third time actually), you will be all set to start using Windows 8. Ubuntu, on the other hand has a much simpler installation process. There are various options for trying out Ubuntu. You can have the full Ubuntu experience without having to install anything with the Live CD. If you like the live version, you can go ahead and install it to your system, doing either a fresh install or alongside Windows. User account setup can be done during the installation process, so you can directly login to Ubuntu once installation is complete. Depending on whether you enabled updates during the installation process or the speed of your network connection, the installation time varies. For a clean setup without any updates or packages to install, Ubuntu should be ready in less than 20 minutes. Also, if you already have a previous version of Ubuntu installed, Update Manager lets you upgrade to the latest Ubuntu release with a single click, anytime. Unlike Windows, any version of Ubuntu can be upgraded to the latest release version. Ubuntu made a departure from the conventional Linux desktop environment called Gnome for a UI developed by Canonical itself, known as Unity. Unity has improved quite a lot over the years as the versions progressed. The latest version, Ubuntu 12.10 (Quantal Quetzal) also comes with Unity preinstalled. The Desktop has maximum visibility with a thin status bar on top displaying time and date, the name of the current user, network connectivity, and application specific menus. On the left side, you can see the launcher having several of your favorite application shortcuts along with the “Unity Dash”. The Dash is an important feature that lets you access files, applications or settings quickly in translucent glass-like interfaces called “lens”. There are no icons on the Desktop by default, but you can easily place as many application and menu shortcuts on it as you like. Ubuntu features many animation effects, pretty much like Mac OSX. In Ubuntu 12.10, the Unity Dash fades into view when you bring your mouse towards the left edge. Whenever you search for something using the Dash, you can see in-lens previews of the results. 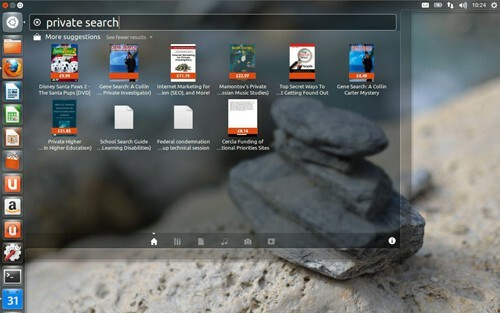 Other visual features of Ubuntu are 3D desktop effects, integrated online searches, etc. Notable desktop effects include flexible windows, 3D cube, ripples, etc. Windows has been popular with its traditional wallpaper based desktop with the taskbar and the Start Button, which gives access to links to your applications and other places on the computer. 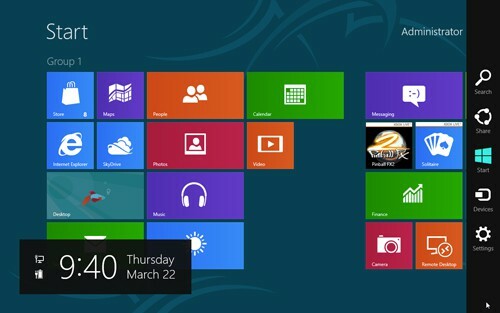 But the latest Windows version has turned away from that and come up with an all new user interface based on tiles. Of course, there is also the conventional Windows Desktop, but the Start Button is missing. Microsoft’s decision to drop the Start Button raised a lot of complaints from users. Some third party softwares brought their own version of the Start Button. One other addition to the Windows 8 is the new File Explorer which features a Ribbon similar to the Ribbon in Microsoft Office 2010. The Ribbon gives you one click access to nearly all related operations associated with the item selected in Explorer. We will discuss more on these features later. Microsoft has totally revamped the user interface of Windows 8 and has optimized the system for a touch friendly environment. But many experts have criticized the user interface as being “confusing” because of its dual nature. Windows 8 comes with a touch friendly tile based Modern UI as well as the traditional Windows Desktop (and that too without the Start Button).And though the Modern UI might be suitable for tablet PCs and other small devices, it might not be an optimal option for full sized display monitors. According to usability expert Jakob Nielson, the dual UI forces to remember where they might find a particular feature. Also, the Modern UI only allows a single app to be accessed at a time, unlike the traditional windows desktop which has support for multiple Windows. Users also have to get accustomed with a lot of new features. This steep alteration in the users’ learning curve has come after a long time. A lot of users are still unaware of what Windows 8 is capable of. Top it up with a whole lot of “hidden” Windows 8 features; hidden as in from the user perspective. Newly introduced features like the Charms UI, hot corners and others can be easily missed if users are not aware of them. Also, since Modern Apps run only in full screen mode, there is no “visible” way to switch between the running apps. What you actually need to do is to move your pointer to the top left corner; you can preview the most recently used app. Moving the pointer along the edge will reveal other open apps. Click on a preview to switch to the respective app. However, the Alt-Tab keyboard shortcut also works. But App switching isn’t possible within the traditional desktop environment, since the desktop is an app in itself! On the positive side, Windows 8 is quite smooth and snappy to work with. On a minimum spec computer, Windows 8 performs quite well; in fact, you could say that it runs better than Windows 7. Resource utilization has been greatly optimized. A previous test on Windows 8 proves that it can even run on a computer having physical memory (RAM) of only 64 MB. Ubuntu has a plethora of new features that makes the OS more usable and productive. The new version introduces some new features that are both visually appealing and useful too. The left panel gives you quick access to all your important applications. Workspaces let you maintain multiple desktops within the same computer simultaneously. Unity Dash allows web searches (application, files, videos, etc.) from within the desktop environment. The Dash can also display application previews without actually launching the app. The social client is integrated into Ubuntu’s menu bar on top. It keeps you up to date with notifications from GMail, Facebook, Twitter and other social networking sites. Another great feature is the Ubuntu Heads Up Display (HUD). The HUD helps you perform application specific operations by searching for it. Hit the Alt Key when running a particular app and a search box appears on top. Search for a command and suggestions will be listed as soon as you begin to type. Once you find the proper command, select it with the keyboard arrows and hit Enter (or click on the appropriate command) to execute it. HUD is a fast way to perform operations where, instead of looking for various options, you directly search for and apply them. As with Windows 8, Ubuntu also has some usability problems – including some hidden features that would not be used unless users are aware of them. The HUD is one example of such a feature. Many users wouldn’t know that pressing the Alt key would reveal such a feature. There also seems to be some problems with Ubuntu’s menu bar. While it shows specific menu items for the application currently on focus, it does not work correctly for all applications. Sometimes, it retains the menu items for an application running behind another one. Ubuntu, being a free operating system, has come a long way to compete with giants like Windows or Mac OS. Still, it has a long way to go. Users expect more from the OS. It has to do a better job to keep up to their expectations. Windows has always been popular because of its wide range of available applications. But now the evolution of the web has brought forth a new trend – the need for social web apps. Windows 8 brings in support for two kinds of apps. One is the traditional legacy desktop type of app (the kind of apps which used to run on your old Windows PCs) and the new mobile platform oriented touch optimized Windows Store Apps, which includes various social integration features among others. Windows 8 gave birth to a whole new genre of devices which are neither PCs nor tablets but in fact a bit of both. Even though working on classic legacy apps can be difficult with touchscreens , and the app count on Windows Store is far from the number of apps for Google Play or Apple’s App Store, the tiled Windows Store Apps have been growing in numbers over the past couple of months and the expectations are quite high. Why? There aren’t enough applications for Ubuntu and Linux right? Wrong! Ubuntu Linux has a whole library of applications from utility apps, to games, to productivity apps and apps to suit your business needs. Ubuntu features its own app store called the Ubuntu Software Centre. Users can browse the app collection and download and install them with a single click. With Ubuntu, you will find an app for just about anything you can do in Windows. That’s not all. With version 12.10, Ubuntu introduced web apps; it means you can use several of your favorite websites as applications directly without the need of opening the browser. The web apps get well integrated within Ubuntu. You can launch Facebook directly from the launcher shortcut, use HUD commands with Gmail, search for content within the Dash, or access GrooveShark from the volume menu. Currently, there are more than 30 websites that support Unity’s new web app API. When you visit any of these sites for the first time on your browser, Ubuntu prompts you to allow the website to integrate with it. Making a choice between Ubuntu and Windows is quite tough actually. Ubuntu being an open source project has proved itself to be good, still bugs are reported from time to time. Hardware has also been an issue for Ubuntu. Though it runs on a wide range of devices, not all devices can run Ubuntu smoothly. Windows has totally revamped its user experience and introduced new interactive features. Whether this will boost Windows 8 sales, is still left to be seen. For both Ubuntu 12.10 and Windows 8, it’s still early days. If you want to experience touchscreen features, while dealing with PC applications at the same time, Windows 8 is a great choice. On the other hand, if you want a cheap and productive alternative, Ubuntu is the one you should go for. Windows through the ages: Has Microsoft Windows stood the test of time?